Until now, social justice and children’s music aren’t something that I thought went together. But I was wrong. 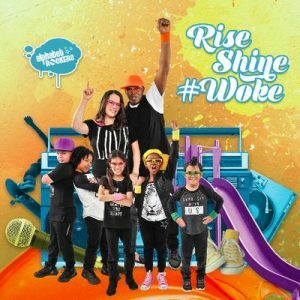 After listening to Rise Shine #Woke, the newest album from Alphabet Rockers, on repeat for the last two weeks, I am a firm believer that children’s music – children’s hip-hop in particular – is exactly where lessons on social justice belong. In addition to Goings, this collection of songs features talented guest stars including Cactus Skidoo, Aaron Nigel Smith, Genevieve Goings, and Juan Amador. It’s not just the adults who are sharing the message though. A group of skilled kids rap on several of the songs making them instantly relatable to listeners. The album opens with the impactful interlude “Don’t Wait” which reminds us that we don’t need to, nor should we, wait until children are teenagers to start teaching them these important lessons. After listening to Rise Shine #Woke during these weeks of great discord in our country, it’s very clear that the time to teach these lessons to children of all ages is now. It’s a great list. Thanks for your smart listening!